Finding a unique style in a blooming industry can be a challenge. 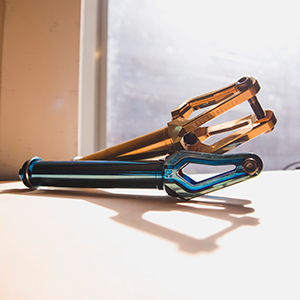 However, Root Industries never backs down from a challenge - and has greatly succeeded with the AIR Series fork. 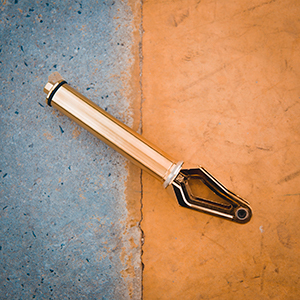 Always staying true to the series mantra, the Root Industries AIR Fork is highly esteemed as one of the lightest and strongest forks on the market. 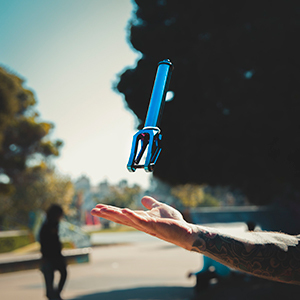 Elegantly carved from a single piece of aluminum, the AIR Series Fork looks amazing and performs even better. 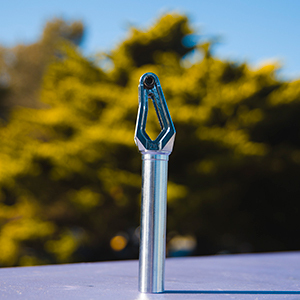 High grade laser etching, embossed logos, and sharp angles make this fork look spectacular from any viewpoint. Swapping out any parts on a scooter can be a tedious task. For ease of installation, Root Industries has included all necessary parts and components for simple assembly.